Why make these nadis public now? Bhagavan Sri Sathya Sai Baba is not an ordinary Avatar. All think that He has left His body. Not only ordinary people, but also those who were close to Him think in this way. It is true that He has ‘left the body’. However, it is also true that He will come again with the same form. … Swami is like a thousand Ramas and a thousand Krishnas in one form. He can do anything! He can leave one body and come in another. If He can return the life of His Guru’s son, after the boy had been dead for twelve years, can He not come in a new body after He has left the old one for 6 months? This will now happen. It is this that is told in both my and Swami’s nadis. This book must be read by all devotees of God. Those who enjoy delving into the Inscrutable, transcendent and ever unfolding play of divinity, will marvel at these readings. In this collection of nadis, the rishis, sages and siddhas declare the greatness of the Avatarhood of Sri Sathya Sai Baba and reveal the incredible conclusion of His mission of ushering in the Golden Age, the Sathya Yuga, the Shakthi Yuga. Any doubts regarding the identity of His consort and their relationship of quiet separation are laid to rest by these enlightening readings. They are but an echo of the prophetic words of Sri Vasantha Sai’s books . 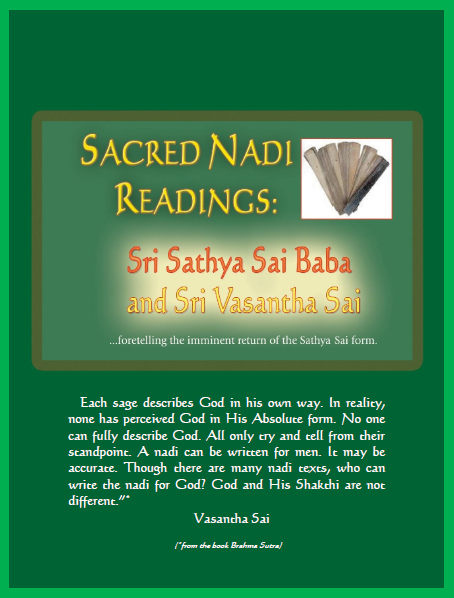 Nadis are sacred palm leaf texts written many thousands of years ago by sages and siddhas. The nadis in this book are placed in chronological order: first, those of Sri Sathya Sai Baba followed by those of Sri Vasantha Sai. They were compiled with the guidance of Sri Vasantha Sai. The nadis are written in the ancient Tamil language in the form of poetic verse in high Tamil. Every effort has been made to translate them faithfully into English prose. Translation has been done for the most part at Mukthi Nilayam. The nadi readings often contain different levels of meaning. Sri Vasantha Sai helped clarify the subtle or hidden meanings in places and added footnotes. Some sections of the nadis have been edited to benefit the reader’s understanding to the greatest degree possible. Occasional annotations have also been added in this regard. To fully appreciate the subtle meanings of these nadis, the books of Sri Vasantha Sai should be read in chronological order. They are themselves nadis recorded by God. At this critical juncture in world history, Sri Sathya Sai Baba instructed Vasantha Amma to take these readings and release them as a book. Now, Sai Baba has begun to appear in physical form in front of devotees. This is the sign of the times and is fulfilling the prophecies contained herein. Let the world rejoice and pray for His immediate blessed return and the successful completion of this great Avataric task of liberation for all. Let there be peace on earth and goodwill between all people and all nations! Sai Ram. 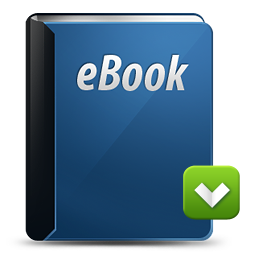 PLEASE DOWNLOAD THIS HOLY BOOK HERE. Sin means to commit an action knowing it is bad. If you know it is bad, it must not be done. However if you still do it, it is a sin. Everyone has a conscience. It tells us ‘this is wrong’, but why do we still commit the sin? It is due to ego, jealousy and anger. This is sin.